Did you ever struggle with exactly how to start a story? Most of us have. Many experts believe the beginning of a story is by far the most vital part of creative writing. Of course, it is obviously the very first thing in which your reader will be digesting when they encounter your book or story. That fact alone makes it pretty important. So now that we understand how important the beginning really is, that brings us back to the very first question on how to start a story. What exactly is a perfect opening? Although you really have to consider every single element of your story, there are indeed 5 specific ways to make your book shine at the beginning. Spend more time than usual on that very first line. Don’t let this tip encourage writer’s block – yes, you just need to start writing. But when you come back to edit, be sure you really put some effort into your first sentence – make it pop – because you remember what they say about first impressions. Everyone likes to debate about whether or not to include a prologue. Even professionals like seasoned authors and agents will put out different advice about them. You have to realize that when many readers decide to try out your book, they most likely picked yours from a stack of others. If your book doesn’t quickly hook them, they will be reading the next book on the stack – so don’t delay beginning your story with prologue – which is what prologues often do. If you can throw your protagonist into an exciting scene, not only will it serve to excite and interest your reader, it will tickle their sense of curiosity too. Because when you start in the middle, you have bypassed many things about the characters. And if the reader really likes any of the characters, then they will hang around to find out more about them. All readers are guilty of doing this – especially rookie writers. Because we want our readers to fully understand what is going on – we tend to give them lots of details – but too many details will kill the story. When we over explain, it is hard not to sound like we are lecturing to our reader and they will not like that. Get in the habit of teasing your reader a little bit by revealing information here and there throughout your book. This should not be very hard to do if you started in the middle of things like we suggested earlier. The great thing would be to do this with every chapter, but you must do with the first chapter. Not only will this keep your reader interested, but he and she will feel good about selecting a good book to read. Remember, they are most likely still trying out your book. And you also gave them a reason to tell their friends that they are “reading a really good book” – which is something people love to tell one another. And the good thing is once they have told another person this; it is almost a guarantee that they will finish your book – in case their friend asks them about the book later. Let’s face it, we writers are very challenged today in this age of distraction. We often struggle just to find the time and the means to be more productive. As we juggle various commitments, as well as dealing all the usual suspects like self-sabotage and procrastination, it can very quickly feel like we are losing ground. 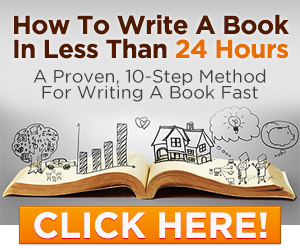 There are many of us who would love to learn how to become a much more productive writer. This is particularly true for those writers who have the career out of cranking out and writing books. These authors have to be productive and self-driven, and they must keep writing books to maintain and build a fan base. Whenever a reader finds writers that they really like, they will proceed to read every single that this author has written. And this is exactly what every author wants because they know these fans are waiting for new books – all they need do is keep writing them. There are many writers out there who make it a point to write every single day – because they feel that they must to be productive. On the other hand, there are yet others who write very sporadically, they may go months without writing anything, for various reasons. But the hard cold fact is that the number of words you write daily does not correlate with your productivity. It really depends on the purpose and quality of your writing. There are lots of writers out there who hardly get an hour or two to write each week, yet they manage to crank out lots of books per year – and more so than many authors who write daily. Do not fool yourself by thinking and believing that writing fast means you write more books than writing slow. We are seeing too many cases where it is not true. Remember the tortoise and the hare fable? Thus, time is not equal to productivity. So let us take a look at three tips for being a more productive writer. Watch out for those excuses. All of us tend to use excuses for not writing. But if we really desire more productivity, we need to assess which of our excuses actually have merit and which are just feeble attempts to procrastinate. All writers will procrastinate occasionally—so don’t feel alone! Make a list of excuses that you like to use and then challenge them. Now make out a reasonable schedule for your writing – and stick to this schedule. Work around your self-sabotage. The one thing that negatively impacts lots of writers is having feelings that their work is unacceptable and lousy. This feeling doesn’t stop there – it also leads to worrying too much about what their readers will think, their about all the rejection, about poor reviews, and the list goes on and one. So when we try to write, that little critical devil on our shoulder keeps whispering negative feedback in our ears. Again, it is time for another list to identify the behaviors that are slowing you down. Then list all the very worst things that could happen and decide how you would deal with them. Congratulations – you just disarmed that little devil on your shoulder. Determine your best time to write. Our energy goes up and down throughout the day. Thus, we need to understand how our own personal biorhythm behaves. This will tell you exactly the best time for you to be writing. You want to be writing when all your facilities are at their peak levels – this will provide very best of your skills. Remember that 1000 words written during your peak time is more valuable than 5000 words written at any other time. Why? Because 5000 poorly written words can make your readers close your book and move on to someone else’s book – especially if those words are in the beginning of your book. Let us face the facts, if you are writer – especially a fiction writer – then you must create some kind of system to generate fresh ideas, and to keep pumping up your creativity levels. People who belong to various writing communities will we often refer to the term “refilling the well,” which is an idea and a a way to explain the notion of staying creative. Most of us can relate to this term conceptually, but like many things, this can be lost in translation whenever we go about applying it in our life. So exactly what does the term refilling the well really look like and more importantly, how in the world are we going to devote any time for it in our busy lives? This is no doubt a very vital issue in the daily lives of many writers. When you make the desired shift to becoming a published author, then you find yourself having brand new levels of expectations from others. The fact is you will have to keep producing good work to maintain your newfound status. Needless to say, this will lead to several new issues in your life. For starters, you will immediately become overwhelmed, so you will first be challenged with balancing your life to keep everything in perspective. But then in order to work, you will find yourself needing that creativity again. You can actually develop a few little habits to set up a mind-set of calm and creativity. One of the best things to do with yourself is engage in self-care. But you will find those who do not endorse self-care. Let us look at a couple of reasons why. Some believe it is touchy feely. Maybe they are imaging sitting around the campfire singing with others who are engaging in self-care. Or maybe they think it is about logging your deepest thoughts in a diary.. The big thing pertaining to self-care is it being totally unique to each individual and is identified by one single thing – giving each writer the ability and even the time to recharge their energy when it has been depleted by other factors. They claim to not have time for this self-care. There is certainly some true to this notion. The thing is that we have lots of writers today who are struggling write around their full-time jobs. And they are juggling household responsibilities, and sometimes even suffer from horrible health issues. However, when you consider all these daily strains and stresses, it actually supports the idea of engaging self-care, doesn’t it? This is actually the magic of practicing self-care. It will give some of your time back to you in the long run. Let us illustrate with an example. Imagine an evening when you come home and you absolutely exhausted, you have headaches flaring up, and after a long hard day working, you attempt to sit down and write. And since you cannot focus very well, it takes all of your energy to crank out 1000 words in three hours. Many writers will agree that this is very low production. Now let us imagine that you come home that day and this time spend about 30 minutes re-energizing and refreshing your psyche before writing. After you do this, you start writing and you crank out 1000 words per hour. In the example above, you actually bought back about 90 minutes of your valuable time. You can use this to spend with your family or even write some more. Still in the process of finding a great story to write? We writers always seem to carry around that yearning. And I am talking about the yearning that every person who communicates with the written words knows all about. I am referring to the strong feeling inside that makes you want to write. Those times when a ball of emotion maybe kicks in and you need to express that in some way. Unfortunately what happens sometimes is that you go to write but all those feelings and urges to write have no target. And without a target, your writing becomes aimless and even incoherent. Without an objective, we start to sound like the elderly lady down the street who babbles on endlessly without ever making a point. Do you want others to read your material and politely nodding – like we do to that old lady down the street? I got news for you – they won’t be reading it in the first place! So what all of us writers and authors need is the ability to generate content that is focused. If it is not focused, then people will not be interested in the story. Of course, the best thing to have is a system or a process that will allow us to collect a reservoir of writing ideas. This way, we have something to get us started. Usually, when we take an older idea, we can apply to new spin or angle to that. Some of the great ideas in the world have been discovered in the pursuit of another idea. How to Get Story Ideas for Fiction Writing – By far the most common question asked of professional writers is where they get their ideas. We all like to think that brilliant, fully-formed story ideas just pop into the heads of our favorite authors. We imagine that if we could somehow learn their secret technique then we too could crank out bestsellers as effortlessly as they seem to. 31 Ways to Find Inspiration for Your Writing – No matter how much you love writing, there will always be days when you need inspiration from one muse or another. In fact, I would argue that inspiration is not just a desirable thing, it’s an integral part of the writing process. Every writer needs to find inspiration in order to produce inspired writing. And sometimes, it can come from the unlikeliest sources.